Zane likes to help around the kitchen. Most of the time, I have to limit him to the smaller tasks, due to safety reasons. 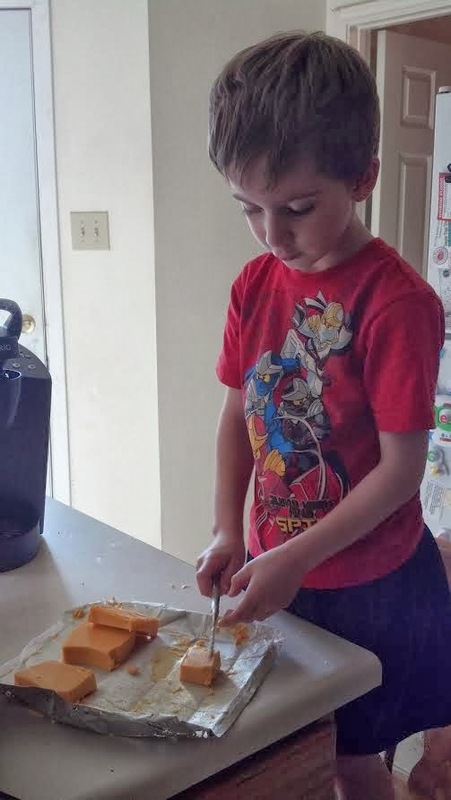 Butcher knives and six-year-olds do not work well together, for example, and they haven't covered fractions or measurement in detail in kindergarten. I still try to come up with things that Zane and I can do together. My mother wasn't the kind of mother who would spend the time teaching a child to cook, and as a result I continue to be all thumbs in the kitchen. Zane and I are learning together. The other day we made our version of crock pot queso. This was a test run for the Super Bowl, unless Velveeta runs out of cheese before then. 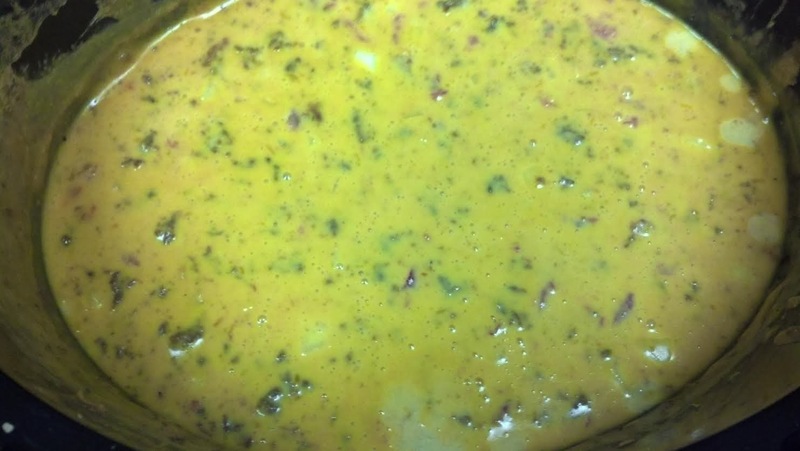 Crock pot queso is a simple recipe. Ours is a variation of the same recipe on the box, with a couple of extras added. The great thing about Velveeta is that it is so soft that it can be cut with a butter knife. That is perfect for a little boy who wants to help! Zane pulled up a kitchen chair and got to work slicing and dicing, after I showed him what was needed. It took him a bit to figure out the best way to hold the knife, but he was careful and consistent, even if his cubes were not always square. Square-ish is fine in my book! 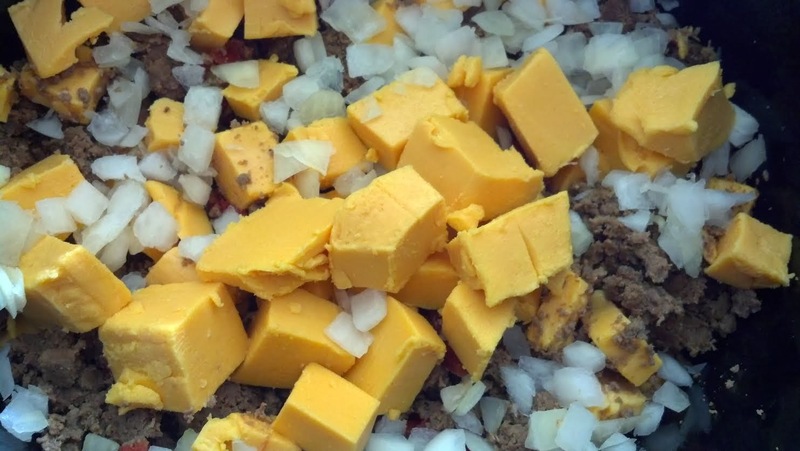 Meanwhile, I took care of the other ingredients: a couple of handfuls of chopped onions, a pound of browned ground beef, and the ever-trusty can of Ro-Tel tomatoes. Whether you prefer to use the vegetarian version of ground beef offered by Morning Star Farms, or you would rather use chorizo or ground up sausage, it's all good. Queso is a very accommodating food, which is why it is so popular. After all of the ingredients found their way into the crock pot, we put the lid on and turned it on high. We cleaned up the kitchen and went to watch the latest episode of Teen Titans Go! As soon as the credits rolled, we checked out our handiwork. I'm looking for other kid-friendly recipes that Zane and I can cook together. If anyone has any good recipes or good ideas, please share! AWESOME!! I was in the kitchen yesterday trying to quickly braise the beef for the crock pot before school, and both the boys came in and wanted to help. Mine are a bit older so they can use the sharp knives, so they did all the cutting. I finished up the last of the stew tonight.... still good even the next day! My younger son loves to be in the kitchen with me and I love for him to show an interest in it. I usually let him assemble things. I'll do the chopping and actual cooking, but he assembles homemade pizzas, sandwiches, quesadillas, lasagnas, casseroles, etc. Anything with layers works really well. We also make cookies and brownies together. I usually use a mix so there's very little measuring but he loves to stir and to roll the cookies into balls. Anything that gets his hands dirty is really fun for him.